As I pulled weeds, I blessed and thanked them for their time in my garden. I experienced nature big and small. I felt the cool breezes as I carefully worked to preserve tiny bugs and spiders, and listened to the birds cheering me on as I worked “the path.” I humbly continued to bless the nature that visited me as I worked in the garden: thank you little butterfly for visiting my flowers, thank you little worm for nourishing the dirt. 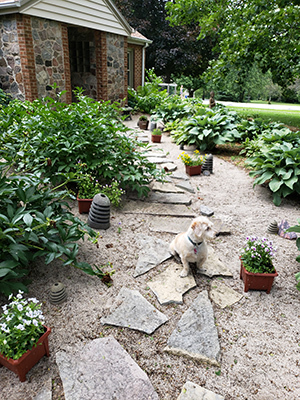 My garden has stepping stones winding through a white sand “lake,” with potted flowers and planted peonies along the path, leading to the front door of my home. I felt that the birds were cheering me on, much like the friends, teachers, pets, and family that have “cheered me on” through the ups and downs of my life path. I felt that each stepping stone was another teacher, another friend, even a stranger, that helped me to learn each life lesson. The sun was hot as I worked through the day, but the cheery chirps and tweets of the birds continued to coax me to keep going. I felt gratitude for each person and animal that has helped me along my path. I felt gratitude for my little dog, Chuck: one of my greatest teachers, as he snoozed on the grass nearby. I looked at the quickly darkening sky and the threat of rain looming, worried that I would not be able to finish my gardening in time. Drat! Then, I seemed to hear Chuck’s “doggie voice” reminding me: You, like the garden, are always in process: never finished, always on the path, just remember to stay on the path! My garden seemed to be a bit of a mess as I worked along. It has been some time since I’ve weeded it, and the once white sand “lake” was full of dark seeds, leaves, weeds, and sticks. My once beautiful peonies have slumped over and their blooms are dried up. The stepping stones along the path are cracking from the harsh Wisconsin seasons, and one of my Buddha statues is peeling. Again, I felt that this was an analogy to life in general. My path is not meant to be perfect. I am the perfection in imperfection, because I am perfect just the way I am! My mind is often cluttered with busy thoughts instead of focused on the present moment, but that’s OK.
Now I start to get angry at the weeds, ripping out large patches of them at a time with both hands. I realize that I’m perhaps “hangry,” really, as I’m a little dehydrated and hungry from the heat. The precepts continue to show up: “Do not anger,” reminds me that it’s time to take a break from gardening. Just as in life, if we all took a little break when we were angry instead of immediately reacting, wouldn’t things work out for the better? Back at it after lunch and re-hydration. I keep moving, weeding along the path back “home.” Doing my work diligently, doing my best to be mindful in everyday life. I feel more at “home” in my body when I am mindful of my thoughts and feelings. I am kinder to myself and others when I am able to take time to pause and go within. I too love to garden. We own a double lot here in Ottawa, Canada and my joy each Spring is watching the Hostas, Violets, Maple trees, Day Lillies, Lillies of the Valley, Morning Glories and others spring to life. Like you, we have weeds but I try not to focus on just how many there are; because they are lots! Sometimes, when I’m thinking of pulling out all the Golden Rods that I have, a bee will land on a flower and so I stop and say, ‘Oh! A bee! Ok, those will stay.’ I love bees! Like you, I also bless the animals that come to visit whether they are my cats, visiting raccoons, squirrels , cardinals and their mates, Gold Finches and Chicadees. All are welcome. I bless the trees and am grateful to them for their continued shade in these brutally hot days. I tell the flowers how wonderful they look today and how blessed I am to be in the pressence of their amazing colours. My garden is my meditation place. ….my ‘Sunroom’. Though I am not a fan of mosquitos, I have a friend who use to own a gardening business who told me that a client of hers uses Citronella plants to ward them off. This was the first year I used three of them to see if it works and I’m happy to report, it does! I am not a fan of the garbage flies and because we had such unusually hot weather for three weeks, they along with the maggots were very visible. I know they are here for a reason, but I did find them bothersome. I’m just not a fan.But I know they have their place. As for your peeling statues, I do understand this. But I think, perhaps their time is up and there is something new on the horizon that will take it’s place to further ‘freshen’ my garden. I do work with angels and so I’m happy to display my angel statues. One is quite large and holds a bird that is actually a solar light. Another is a smaller angel that is holding a rabbit. Both of these help me to further appreciate and connect with the animals I give Reiki too and for all future ones I’ve yet to help. This was so lovely. Thank you. I loved all the aspects of returning home. Totally going to steal your reminders of space and gratitude. How lovely to be in the presence of kindred spirits- though I do wonder what is a weed? So often I find it so hard to say “you do not belong here”- I love them all specially the ones with tiny yellow flowers!